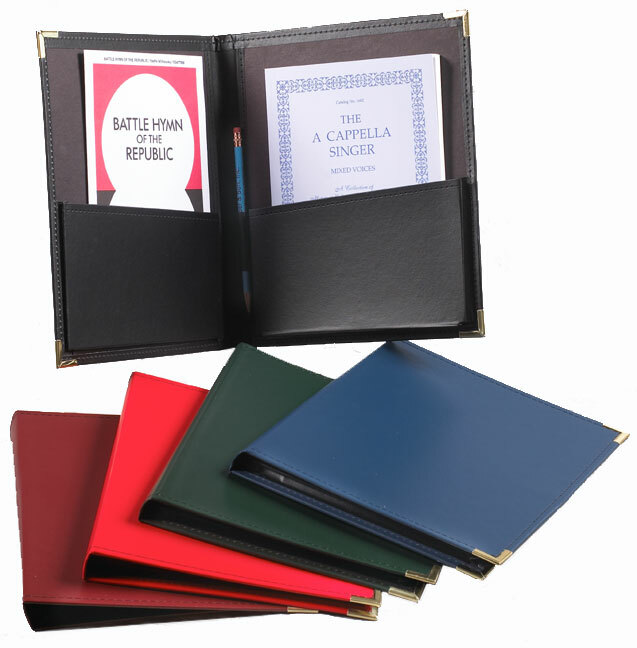 Our Model 802 (9.5" x 12") Choral Folder features a smooth, sleek leatherette material that is PVC-coated for greater durability. The deep, gusseted reinforced laminate pockets have the capacity to hold music up to 8 1/2" x 11" in size! Heavy-duty metal corners, turned-edge construction, reinforced spine, vinyl pencil holder and stitching make this an outstanding buy! Burgundy folders shipped after September 1, 2016 may be a slightly darker shade then previously ordered. Help your group stay organized while looking their best! We offer the best prices and most professional embossing available. We imprint your folders personally, so your folders ship quickly and carry our 100% Pepper Guarantee. And, our quantity imprinting discounts make it affordable to customize folders for your entire group. Gold embossed imprinting Order 50 or more folders, and get two lines of imprinting FREE! Numbers, Instruments and Personal Names -Only $1.00 per folder for each added line! Personalize your folders to make keeping track of music even easier. Add numbers, instruments or personal names in the corners! There are no quantity discounts for additional lines. Information can be located in the upper right and lower right of the Folder corner. Imprinting is available for this item - see information in order basket. Made with over 90% Recycled materials.